Italy, along with Spain and France is one of three superpowers in wine production. But is there any such thing as Italian wine? Wine has been produced on the Italian peninsula for three millenia, having been brought to Sicily initially by the Greeks. But there are so many varieties, so many regions and so many terroirs. So when someone asks me "What do you think of Italian wine?" I can't really give a short answer, so a long answer will have to do. These few pages will explore the amazing diversity of wine in Italy. It is organised by Region - accessible from the menu at left. The idea of an Italian nation came fairly late to Italy. The great il Risorgimento or unification of Italy happened a mere 150 years ago, a mere trifle in terms of the ancient history of the people, the cuisine and the culture. It is therefore better to talk about regions rather than try to make too many generalisations. 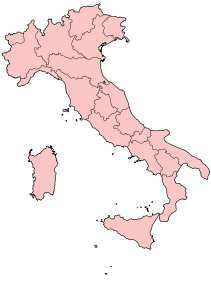 The Wine regions are organised into the administrative regions, and wine is grown and made in all of them, from top to toe, and on the Islands of Sicily and Sardinia. I know I've just said you can't make too many generalisations but allow me to make just a few. As in all old world countries the wine industry is heavily influenced by traditions, handed down through the centuries in families, villages and cooperatives. The vast majority of Italian wines need to be served with food to be enjoyed. Globalisation is ringing in changes as many winemakers now have international experience and are bringing in new winemaking philosophies methods and technology. The Super Tuscan phenonemon is just one example. The last point above is important, if you haven't tried an Italian wine recently you know what you should do! If you have tried a great Italian wine, share your thoughts with other vinodiversity readers. OK, now for a quick guide to the wines and the regions, but of course we will have to talk about the food as well. They are inseparable.